I got a special request to make my lasagna and of course since I don’t make the exact same recipe twice I had to put a new twist into my lasagna. 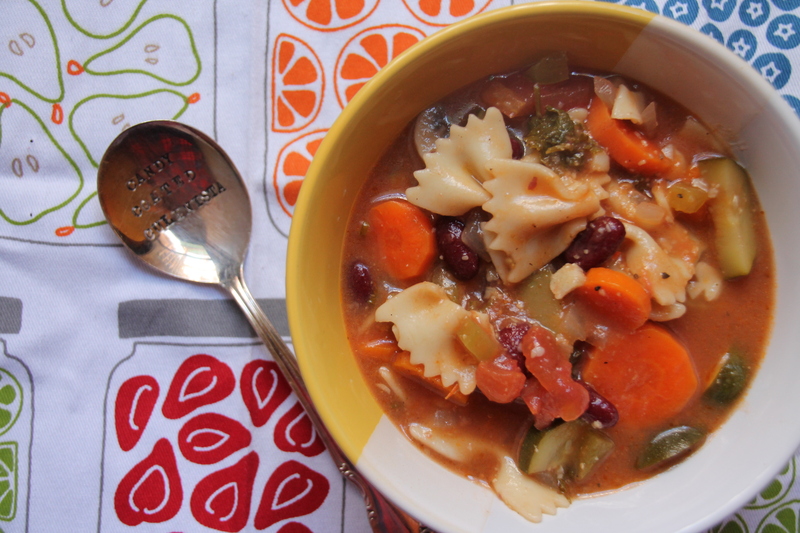 This recipe however took a very unexpected turn when it caused my third kitchen injury and this one was the worst yet; and had me almost contemplating going to the ER. To make zucchini lasagna there are two options using a knife to make thin strips or the easier way using a mandolin. I used my mandolin and was slicing the zucchini with no issue without the guard on (yes I know bad idea right) I was slicing away and then I noticed there was blood on the cutting board and I still didn’t feel anything mind you. I look to see where it’s coming from and I’ve sliced off a chunk of my finger and fingernail. Sighhh. Surprisingly it didn’t hurt and after an hour of getting the bleeding to stop and a quick google search of when to go to the ER regarding deep cuts. Not to forget I also checked how to glue a cut together if necessary as I had crazy glue in my tool box it finally stopped and I went back to the business of slicing zucchini and using that guard. Never again will I not use the guard. 1. Pre-heat oven to 350°F. 2. In a large saucepan sauté onion and garlic in a tablespoon of olive oil over medium heat until softened. 3. Add ground turkey and spices and cook. 4. In a small bowl mix together the fresh herbs, ricotta cheese and egg and set aside. 5. Using a mandolin slice the zucchini lengthwise. 6. Place a layer zucchini in a baking dish followed by ricotta cheese, spinach, pasta sauce, parmesan cheese and mozzarella cheese. 7. Repeat step 4 until all the ingredients are finished. 8. 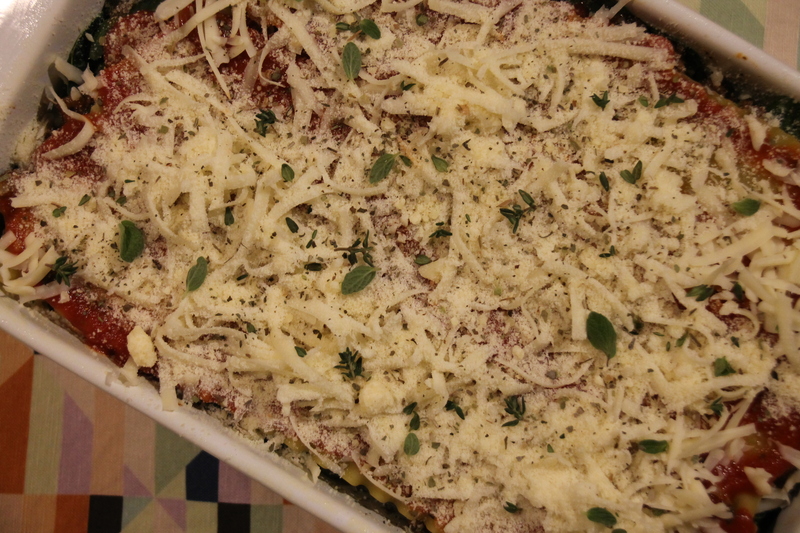 Add the finale layer of zucchini and then sprinkle with mozzarella and parmesan cheese and sprinkle with fresh herbs. 9. Bake for 45 minutes and serve. Wow another recipe I enjoyed with no carbs and it was very satisfying. I didn’t miss the pasta and it tasted wonderful. I’m not sure if I could get any guests to enjoy this if I actually mentioned first that there is no pasta; but ever morsel was consumed. Also I’m very happy I didn’t bleed on any ingredients and if I had to cut myself I did it at the best time possible. Lemons, lemons and more lemons! If you are a lemon lover this recipe is for you. 1. Bring a large pot of salted water to a boil over high heat. 2. Zest finely 2 lemons and set aside. 3. Trim the top and bottom off the other two lemons and cut lengthwise into quarters and remove any seeds. 4. Thinly slice the quarters into triangles and blanch lemon pieces in the boiling water for 2 minutes. Then transfer using a slotted spoon to a paper towel to dry. 5. In the same boiling water add pasta and cook until al dente. 6. Drain water; but reserve ½ cup of the pasta water. 7. Using a large frying pan, heat 1 tablespoon olive oil over high heat. 8. Add the dried lemon pieces and season with a pinch of salt and sugar. 9. Cook until the lemons are caramelized, for 3 to 5 minutes and then transfer to a plate. 10. Over medium heat melt butter in the leftover oil and add the chili flakes and lemon zest of both lemons until fragrant. 11. Whisk in the reserved pasta water. 12. Toss in pasta, the juice of one lemon, cheese, black pepper and the remaining salt. 13. Cook until pasta is coated with sauce and add in the caramelized lemon. 14. Add celery leaves and parsley if desired. 15. Taste and add more lemon juice, drizzle olive oil and cheese if desired. 16. Sprinkle with sea salt and serve. Sometimes it baffles me how picky people really are. I mean with so much different types of foods available to us how you can only eat a handful of foods, especially when you have no food allergies of dietary concerns. When these people enter my life I always advise them to beware if I’m going to be making you meals be prepared to find new produce because it’s not going to kill you and I’d of course never give you anything that would cause you harm. This meal doesn’t contain anything out of the ordinary yet for some reason items here are not commonly eaten if you can believe that. Everyone is different right. 2. In a casserole dish mix soup and water together. 3. Pour pasta and vegetables into the dish and mix well. 4. In a bowl season chicken with sea salt, pepper, oregano and Italian seasonings and place on top of pasta. 5. Sprinkle cheese over top of chicken followed by parmesan cheese. 6. 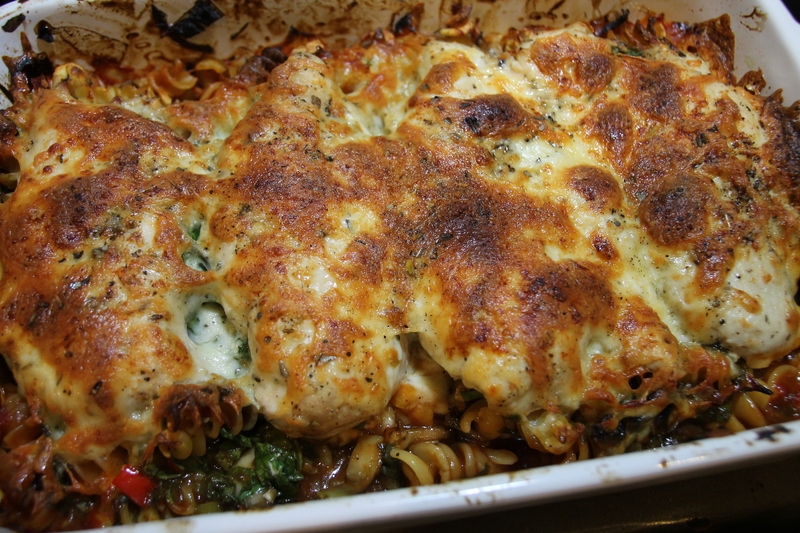 Bake for 45 minutes until pasta is tender. 7. Broil cheese at 450°F for 5 minutes until cheese is a golden brown. This recipe couldn’t be any simpler and that is a perfect meal. Compliments were positive all around from “I loved it” to “man that was some good food you cooked” followed up by what else can you cook lol. Needless to say I sent them home with a serving for later consumption. When I was a child pasta night was always Friday and my mom would make her tried and true pasta dish. I have been reminiscing and thinking about my mom more than usual lately and I decided to pay homage and make my version of her dish. 1. In a large pot of boiling salted water cook penne until al dente. 2. Drain in a colander once cooked. 3. Using a 12” cast iron skillet brown the ground beef and add the salt, pepper, paprika, season salt, onion powder and garlic powder. 4. After 5 minutes stir in the diced garlic along with the mushrooms, onion and grape tomatoes and let cook for another 5 minutes, stirring occasionally. 5. Pre-heat oven to 375°F. 6. Stir in the marinara sauce to the meat mixture and add parsley and cook at a simmer for 5 to 7 minutes. 7. 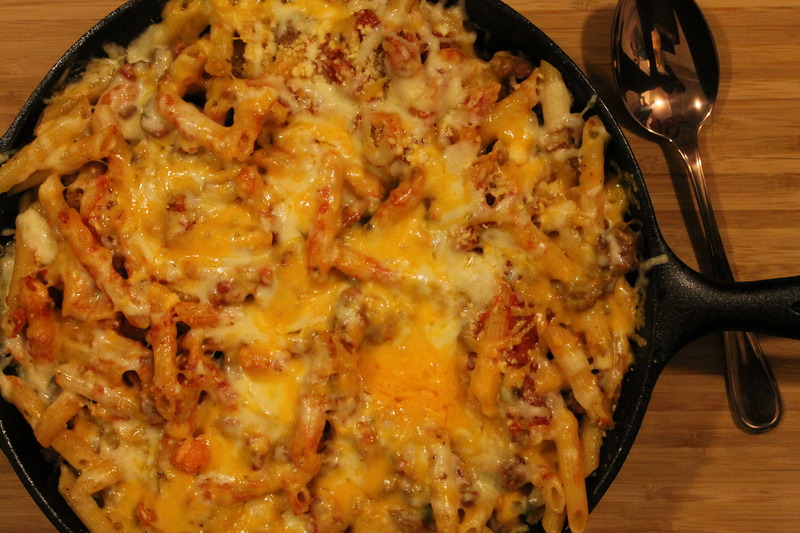 Pour pasta into the skillet and incorporate into the meat mixture. 8. 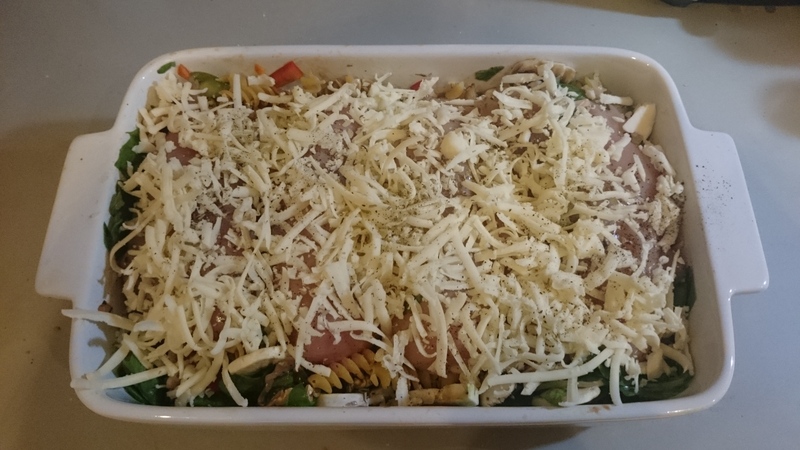 Sprinkle the cheese on top and bake for 10 minutes to allow cheese to melt. •	Freeze some to bake at a later time. 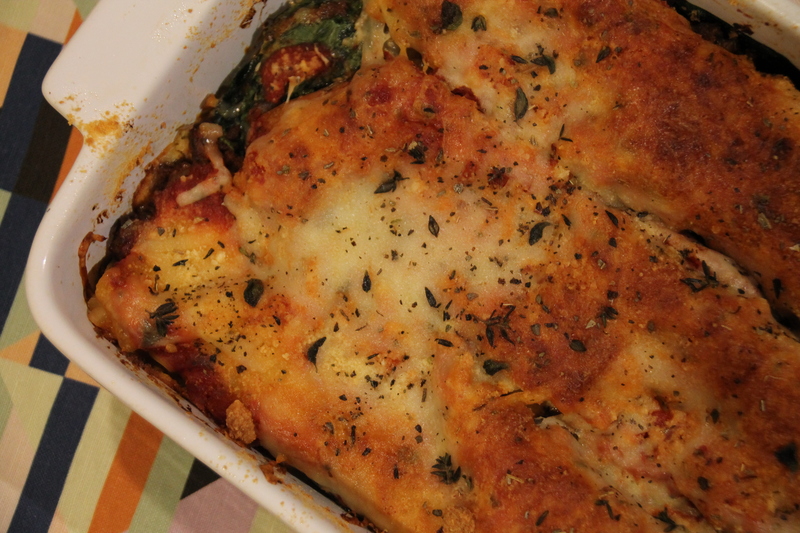 I was so happy with how this tasted and turned out and it was true to my mom’s dish. My mom used a stovetop skillet; but since I have a nice cast iron skillet I decided to take it to the oven and bake it in the dish. I just wish the thing was a little lighter is all. 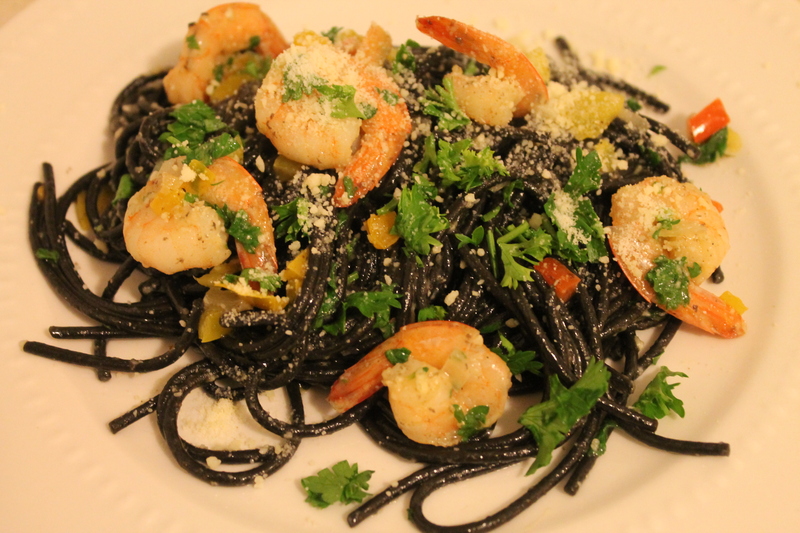 Black pasta, is there such as thing? Cuttlefish has ink? Who knew is what went through my mind when I saw a commercial for Spaghetti al Nero di Seppia with Clams. I thought the idea of black pasta was kind of cool and then I learned that ink in sea creatures doesn’t only come from cephalopods but other sea creatures like the cuttlefish can create ink. Well didn’t a 30 seconds commercial teach me a lot. 1. Set a large pot of salted water with a little vegetable oil to a boil. 2. In a frying pan with olive oil on medium-high heat and add onions, peppers, garlic, spices and cook for a few minutes. 3. Add in olives and garlic and continue cooking for a 2 minutes. 4. Add the wine and bring to a boil, then add shrimp cover and cook until shrimp are cooked through thoroughly and remove from heat. 5. Once water is boiling place pasta in and cook until al dente; drain in a colander. 6. 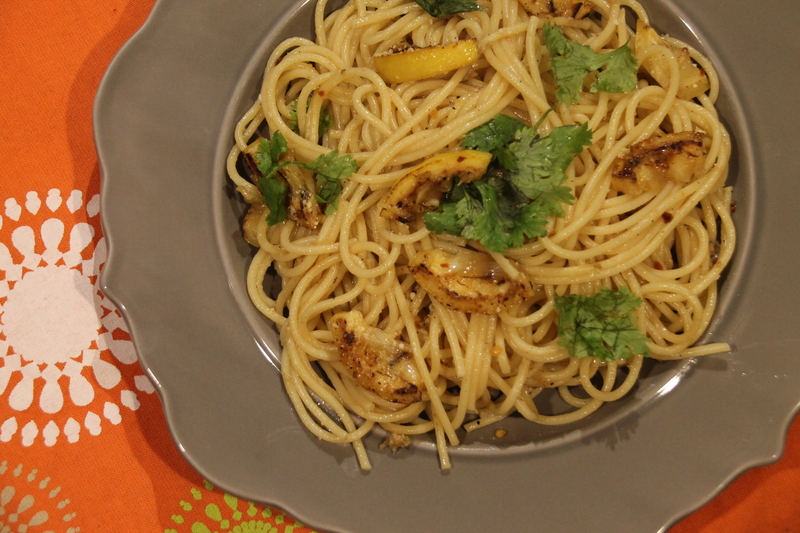 Combine the shrimp with the pasta in a platter and sprinkle parsley and parmesan cheese over top. Delicious and I felt quite “chefy” making this dish. It’s simple, but eye-catching and I got to practice my knife skills with my new J.A. Henckels Professional Knife set. Man are these knives sharp, I already took out a piece of my finger nail when the knife jumped within the first few days of having this set. 90% of my vegetables were all the same size as I am getting better, but uniformity adds to my prep time for sure. The wine sauce was delicious and the shrimp was perfectly cooked. Next time I will try it with clams, as Mr. C. loves his molluscs. I think i’ll take a walk down to St. Lawrence Market and get some fresh seafood.